Is this a sweet looking cover or no? Jason G Anderson’s newest release is a full-blown novel. I’ve known Jason for a while now, and he’s been kind enough to post several releases on his site. Today I get to reciprocate. If you are into Steampunk, if you like adventure, if you like the magic of Wonderland, then pick this up. Without further delay, here’s Jason talking about his latest work. Edited by Lynn O’Dell (Red Adept Reviews). 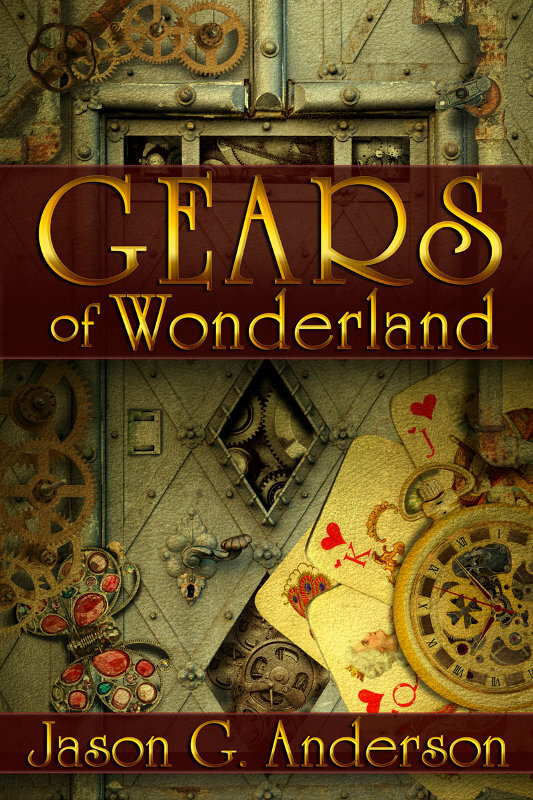 Jason G. Anderson has just released a new novel, Gears of Wonderland. Fans of the steampunk genre will find a lot to enjoy in this new visit to Wonderland. The idea for Gears of Wonderland came while I was planning for NaNoWriMo 2010 with a totally different idea. My wife and I watched the SyFy version of Alice, and I got struck by the idea of writing about Wonderland. But not the normal Wonderland. This version had gone down the steampunk route, and assumed that the original Alice stories happened around the time they were published (about 150 years ago). A lot can change in 150 years. Because NaNoWriMo was only a few weeks away at the time, I initially tried to ignore this new idea and keep concentrating on my original story, but it wouldn’t leave me alone. In the end I admitted defeat, and switched to working on what would eventually become Gears. I’m very glad I did! The main character in the novel is James Riggs. After a fight with his fiancée, he goes to visit his best friend, only to witness that friend’s murder. As he escapes the killer, he is intentionally thrown down a hole by a man in a white suit, and finds himself in Wonderland. He meets the daughter of the Mad Hatter, and learns that this Wonderland is nothing like the one from the original stories. This Wonderland has flying ships, steam powered carriages, and giant walking machines of war. The Knave of Hearts, Lahire, has taken over the Heart throne and used the war machines to conquer all of Wonderland. He allows no dissent to his rule – people who resist are sent to the mines, or simply beheaded. There are a few groups who still try to fight back, and James is saved from Lahire by one of these groups. Everyone seems very excited about a tattoo he has on his arm, and they decide to take James to see Caterpillar to find out what it means. The rest of the novel is James finding out what the tattoo means, and helping the resistance fight back against Lahire. Not surprisingly, I had to re-read the original Wonderland tales so I could remind myself what happened in them. I almost got caught out by the first version of Alice in Wonderland I downloaded – it was an abridged version, although I didn’t realize it at first. Luckily I finally realized that several scenes I was expecting were missing, and went hunting for a complete copy. I also did some minor research on the names used in different languages for specific playing cards and chess pieces. A number of character names in the stories are based on those names (eg: Lahire = La Hire, an old French name for the Knave of Hearts playing card). He only has two minor appearances in the story, but I really like the Mad Hatter and how he interacts with his daughter (Kara) and James. I hope that I managed to have him live up to his reputation from the original stories. I also like the character of the main villain, Lahire (the Knave of Hearts). I tried to make him more than simply a bad guy doing bad things because he’s “bad”. Hopefully readers will find there are many layers, and conflicting ideas, within him. 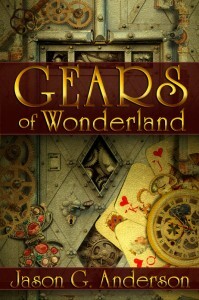 Gears of Wonderland is available on Amazon (http://www.amazon.com/gp/product/B005USJ5U8) and Smashwords (http://www.smashwords.com/books/view/96393). Hopefully it will soon be approved into the Premium Catalogue on Smashwords, which will then distribute it to other ebook retailers like B&N. I’ve only been writing fiction in the form of stories for the past year, but I’ve spent the last decade writing material for tabletop roleplaying games, as well as running several games via email. Running a roleplaying game over email is a lot like writing a story, except you have other people playing your main characters in the story (making it a very interactive experience). You literally have no idea what your characters are going to do next! The best place to find out more about me and my work is my website at http://www.jasonga.com – I also have links on my site to my Facebook and Twitter accounts.